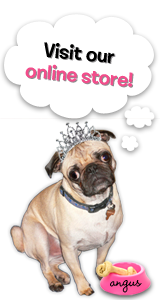 The Rubber Cafe Design Team Blog: Leave A Little Sparkle! Oooh! 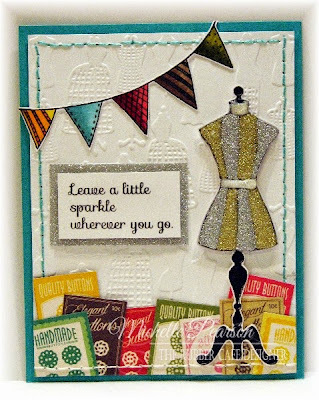 Have you not just LOVED all of the fun cards coming out of this month's Good Times To Follow Kit?! I used a bit of hand stitching to add a little more themed detailing to my card. I cut out elements from the paper pad to layer across the bottom before sewing them down with contrasting thread. I colored the banner with Copic markers before fussy cutting it. I wrapped the tails around to the back of the card. I stamped the image on acetate and originally glittered the back with the Gold and Silver Medal You're So Fine Glitters, Scrap Happy Glue and Detailer Kit. I must have had a bit of a heavy hand with the glue because I could see it when I was finished. True to my don't toss anything style, I added a touch of glitter to the top of the acetate to create a fun dimensional and glittery dress form which I then popped up on foam tape. I created a frame for my sentiment with Scor-Tape and glitter.